Looking for a door stop that actually works? Whether you need a baby safety door stopper or a door holder to keep doors open, want to keep your home cozy with a door draft stopper or wish to ensure that a door remains open for easy access to a room in your office, SofiHome® Rubber Doorstops Accessory Set is the perfect solution for you. ✧BONUS✧ Order NOW & get the $20-worth EBOOK Keep Your Baby Safe Without Having To Be On "Parent Watch" 24/7 for FREE! SofiHome rubber door wedges are indeed YOUR BEST CHOICE. Why? MORE CONVENIENT: You won't need to look for the doorstop! - it is just there inside the hook! MORE EFFECTIVE: Non-slip texture for optimum friction with any flooring surface. Stops drafting doors perfectly even the heavy ones! MORE LASTING: Made out of Durable, Intensively Tested and Optimized PREMIUM RUBBER. ODORLESS: Unlike other rubber door wedge products, our door holder is odor free! STYLISH: Unlike other clunky rubber/plastic door jammers, our door stops are uniquely crafted with a sleek low-profile design to perfectly complement any décor style. These rubber door stoppers really are the last ones you will ever need to purchase! Start guarding those slamming doors now - Click Add to Cart and get your DISCOUNT & BONUS TODAY! *This stopper does not work as a security tool to keep a door closed against a force opening it. It will not protect against intruders trying to break into your home! Its job is to hold a door open!  NEVER LOSE IT - You won't need to look for the door stop - it is standing there inside its hook! 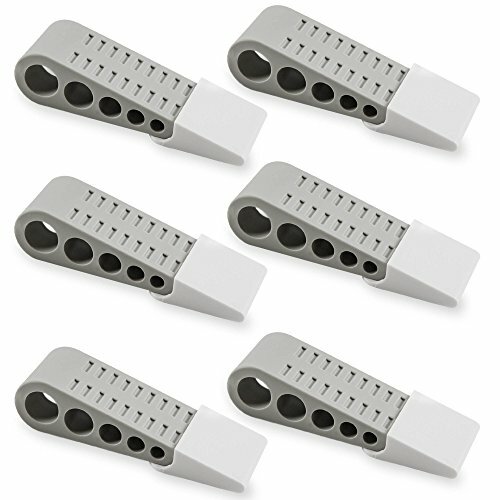 The storage holder piece provides a convenient reach to the door wedge whenever required.  MAXIMIZE VALUE - 6 pack of (L 5.1" x W 1.6" x H 1.3") SofiHome® decorative door stoppers including storage holders at the Best Price! Protect each door and wall by ordering more than one pack for even a Better Deal! (Check out "Special Offers" section for details).  WORRY NOT & GRAB YOUR BONUS - Enjoy SofiGOODs' 100% no-questions-asked refund policy & a free $20-worth EBOOK sent to your email.  SECURE STABILITY & AVOID SLIDING - SofiHome Tall Door Stoppers are designed to securely wedge even the heaviest doors on any floor surfaces. The heavy rubber material provides an optimum friction effect to fix the door dead in its tracks!  GET IT & FORGET IT - SofiHome door stops are made of a Durable, Odorless and Intensively Tested Premium Rubber that will last and function for many years to come. If you have any questions about this product by SofiHome, contact us by completing and submitting the form below. If you are looking for a specif part number, please include it with your message.